Not sure if you have been reading the newspapers recently, but it looks like we are about to enter another evolution in coffee drinking. News journals from your local paper to international magazines like the Economist have been featuring articles on the fall of Starbucks and the entry of McDonalds into the coffee shop market. Apparently, there was a study done last year in the US and more people preferred coffee made by McDonalds to that from Starbucks – Ouch ! True, we are not talking about the stuff we have been getting at McDees for years as McDonalds have invested in buying higher quality coffee beans and equipment and so have upped the competition a bit. McDonalds plan to roll out more cafes over the next few months whilst Starbucks struggles to get back its reputation. In any case, there appears to be a battle on the cards and to avoid getting sued by the big boys, I’ll keep this post brief and encourage you to experiment with which coffee you prefer if you have the time and money of course. As soon as I get some big bucks to pay big lawyers’ fees, perhaps we can run our own poll next year on who is best. In any case, I think it’s positive, as it is giving way to more publicity about the quality of coffee – something I’m really trying to push for. For more reading, check out www.economist.com and use their search engine for Starbucks. 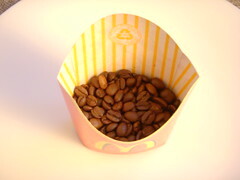 This entry was posted on Sunday, February 3rd, 2008 at 10:30 pm	and posted in Coffee News. You can follow any responses to this entry through the RSS 2.0 feed.